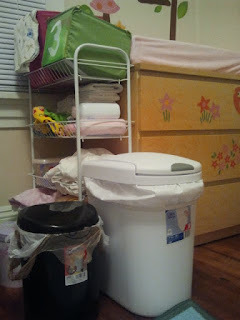 We've now added a diaper pail and flip-top trash can to our diaper station (both from Target). This upped our cloth diaper investment to $100. Without the generosity of others, the investment would have been $400 - $500. We already own 3 Planet Wise bags: 2 large pail liners ($16.50 each) and a medium wet/dry bag ($19.00) for our diaper bag. They do a fabulous job of keeping the wetness and smells inside of the bags. 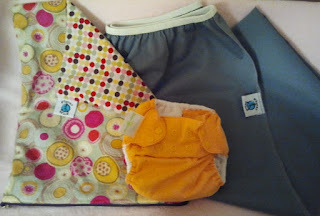 We've found a rhythm with diapering. I'm washing 12 diapers per load and washing every other day (ish). So far, I've done 10 loads for a total of 120 diapers. That's (approximately) 40 diapers per week, which is equal to a pack of diapers that we didn't have to buy. So for simple math's sake, at $12 per pack we're saving $12 each week. At this rate, we'll have our $100 investment "paid off" in 5.5 more weeks!